The West Coast Science Fantasy Conference aka Westercon is a regional science fiction and fantasy convention geared toward fans, musicians, writers, and filmmakers of the genre. It is typically a four-day event that is traditionally held during the Independence Day holiday weekend. The location rotates to a new city each year, chosen somewhere in the United States west of the 104th meridian line. The guests of honor are chosen from professionals who live in the Westercon region. This year, Westercon was held in San Diego, CA at the Town and Country Resort in conjunction with two local conventions, Conjecture (a science fiction and fantasy literary convention) and ConChord (a filk singers convention). It is a lovely hotel filled with bright blue swimming pools, blooming roses, and garden settings. This was my first time at a regional literary convention. The size and scope of it was bigger than I had expected. I was registered as a panelist for the first time and I participated in two events. The first event was a lecture on Author Platform, based on the methods that I use to promote No Wasted Ink. My lecture was well attended and I found the give and take of questions during the lecture to be interesting. I hope that my information was of help to my fellow authors. My second event was a panel that I created to feature the local authors of Broad Universe, a writing guild where I am a member. Broad Universe is an international non-profit writer’s guild that promotes women writers and editors in science fiction, fantasy, horror, and other speculative genres. 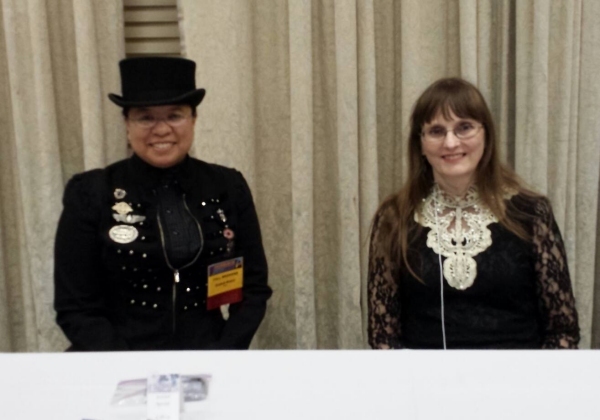 It began as a panel discussion at WisCon back in 2000 and has grown into a large volunteer-run group that attends various conventions and conferences to promote the member’s books. One of the more popular activities of the group are known as “rapid fire readings” which feature group readings by the authors in convention panels or as a salon reading in the evening. Broad Universe also offers access to Net Gallery, occasionally have tables where member’s can sell their books at science fiction conventions and is a great place for authors to network via their email list, Facebook group or Twitter. 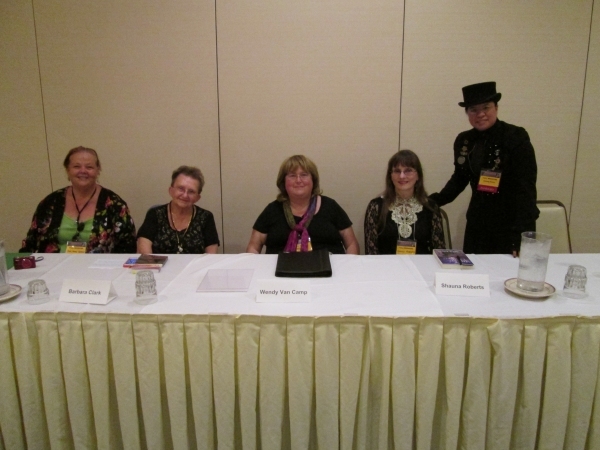 Our panel was given a great time in the convention on Friday afternoon. 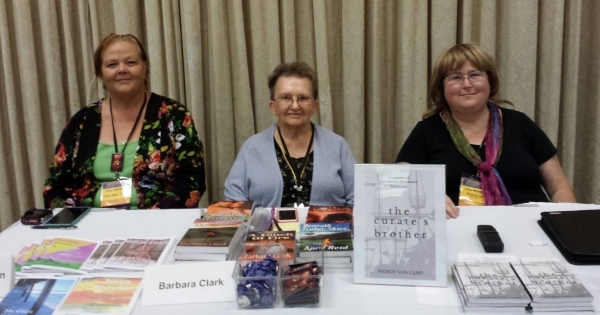 Our Broad Universe readers were Jude-Marie Green, Barbara Clark, Wendy Van Camp, Elizabeth Watasin, and Shauna Roberts. I was surprised by the turnout of listeners, many were women that sat and knitted as they listened to our stories. Having my own handmade jewelry in the art show at Westercon, I was gratified to see the support from fellow artisans. There were also a scattering of men and women who were typical convention attendees that came out of curiosity to experience new authors. After our hour-long panel, we proceeded downstairs to the dealer room where a pair of tables were set up for authors to autograph their books. It was not set up for our group alone, but all the authors had a place on the schedule, including the big name authors that attended the convention. All of us sold and autographs books that afternoon. For the writers and fans of science fiction, literary conventions are a great place to learn more about the genre, meet famous authors in person, network with your fellow fans, authors, filmmakers, or to explore your wild side by costuming. Fun! Let’s do it again!